Design your own truly unique baseball trophy by adding your custom graphic to the shooting star baseball topper. The gold and black star riser gives the trophy substance and height, and the round weighted black base offers plenty of room to personalize for your event or an individual standout performer. A shooting star and megaphone rise over an area where this trophy can be customized with your own graphics, such as a photo or a team or school logo, to make it truly unique to your event. 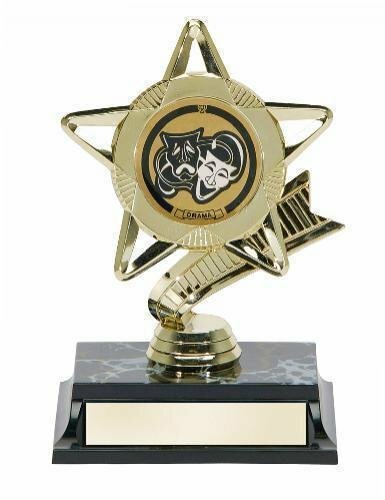 It's mounted to a black star shaped base that has plenty of room to personalize, and is a great way to award excellence in cheer. Pretty in pink is the theme of this sweet little dance trophy. Add an insert customized in full color with the graphics of your choice to create an award unique to your event. The sculpted black base has lots of room for personalization to complete an award that is both budget friendly and fun to receive. Everyone in your Fantasy Baseball league will work even harder to be your league champions and bragging rights when they see this incredible trophy . 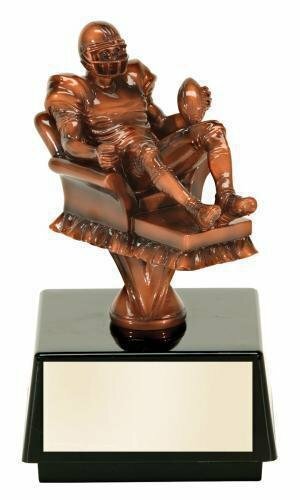 The rich bronze colored figure depicts an arm chair baseball fan sitting in his favorite chair, baseball and glove in one hand, remote control in the other while wearing a baseball uniform to complete the look. This award stands 8" tall and the beautiful black base provides plenty of personalization area for what ever your needs might be.